bad angle or bad angel? Let’s ignore the whole windswept look of this…are they adoring the baby in a windtunnel? They should really put a hat on that little guy. No, let’s go straight to the issue of the horns on the angel. Sure, they might just be the angel’s wings, photographed at the wrong angle. Might. It still doesn’t explain why someone with wings feels the need to get a piggyback ride from Mary. This entry was posted in bad angle on December 5, 2007 by admin. Horns, definitely horns. Notice how the little devil’s hands are poised, ready to yank Mary’s head scarf down over her face, then grab the baby and RUN. 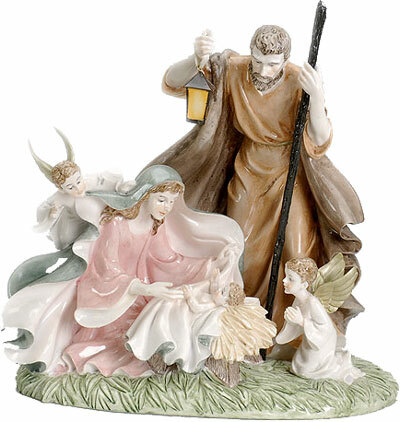 Meanwhile, poor Joseph is just trying to keep his footing against that stiff headwind. That horny little devil is doing the “loser” hand symbol to baby JC! I think he is also telling JC to ride a Harley with his robes billowing like Mother Mary’s…hehehe, a reference to your post last week, how clever of you! Sara, you ROCK! Your humor is getting me through a rather stressful week. Thank you! Why is that angel holding on to Mary’s veil/robe/head scarf with his chin? He seems like he has a perfectly good set of hands. Oh, that’s right — at least one is too occupied with making the “loser” symbol to hold on. Maybe it’s a goat angel… in which case, this one should possibly be moved to the “inter-species” category? “Pay no attention to the man behind the Virgin’s headscarf”. Who ARE you? Why are you not my next-door neighbor? Thanks for the 300 laffs I just had in this boring stupid suburb.